Time away from running the shop just about every waking hour has given me the time to think I was looking for. However I wasn’t just interested in market stalls, pop-up shops and curated spaces but also all the options available to artists these days when trying to firstly reach the public with their music and then monetise this music. You will see the word monetise a lot ! It is a lot more complicated than simply selling your LP or CD these days and the irony is that artists often weren’t even well equipped to do just that. Even though at the coalface I was still well aware I didn’t understand “the big picture” fully. The many industry experts I hear talking blatant rubbish do nothing but cause damage yet if enough of them repeat the same lie …………………. I really wasn’t sure if there was a theory of everything that involved shops in any meaningful way. I was quite prepared to accept that all the developments meant that shops had become an irrelevance good for nothing except selling Bowie picture discs, second hand vinyl and if lucky, tickets. For all the twitter talk the Specialists (mainly HMV and Amazon) outsold the indies almost 9 to 1 on this week’s Cerebral Ballzy album and that is before we get to exactly what the sales figures were. The entire profit from that album would barely pay one senior member of staff in one shop. Indies sold 1.6% of the new Lana Del Rey album and that is doing well. 1% is more common for a really big selling album. Don’t get me wrong there are shops out there doing well just not many. My interest is whether there is any possible way forward for a shop that wants to support and actually sell new music rather than depend on other revenue streams and Led Zeppelin reissues. And even if there is a way forward does that opportunity exist in Edinburgh. Anyway I’m almost there and the answers have surprised me. I certainly couldn’t be accused of coming up with the results I expected. Sad that I am I found the whole interaction between crowdfunding and streaming/Spotify and bandcamp fascinating and there is without doubt merit in all these platforms but they are not without their weaknesses and coincidentally , or maybe not, they were often a shop’s strengths. So a “theory of everything” that involves artists, labels, distribution, record companies, shops, online selling, bandcamp, streaming and crowdfunding. Not aiming too high then ! 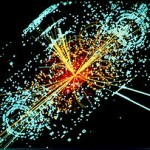 More Higgs boson than Hitchhiker’s Guide to the Galaxy.